Morbid obesity is characterized by an individual weighing more than 40 kilograms (100 pounds) over their ideal body weight, or having a body mass index (BMI) of 40 or higher. Throughout this site, the term “morbidly obese” is used to define an individual weighing more than 40 kg over their ideal body weight. Mass media and the public sometimes refer to morbid obesity using the term “severely obese.” These two terms may be used interchangeably. Obesity is a serious health epidemic. About 30 million Indians are obese. Obesity is a disease characterized by excessive body fat or by having a BMI greater than 30. Morbid obesity is characterized by an individual having a BMI greater than 40. In addition, it also includes people with a BMI of more than 35 and associated weight related co-morbid conditions, such as diabetes, heart disease and many more. Morbid obesity is most commonly calculated using BMI. BMI is calculated by dividing a person’s weight in kilograms by his or her height in square meters. Patients with a BMI of 40 or higher are classified as morbidly obese. To calculate your BMI, please click here. What are the risks associated with morbid obesity? Many co-morbidities accompany morbid obesity. Once a patient is considered morbidly obese, these conditions become serious health risks. These co-morbidities also negatively impact the quality of life for a patient and their family members affected by morbid obesity. Those who are affected by morbid obesity are encouraged to talk with their physician concerning the co-morbidities listed. The earlier these are detected, the better advantage a patient may have to keep them under control with the assistance of a physician. Morbid obesity is simply not a result of overeating. It is a serious disease that needs to be prevented and treated. The causes of morbid obesity are widespread, but target three main contributors: behavior, environment and genetics. In today’s fast-paced environment, it is easy to adopt unhealthy behaviors. Behavior, in the case of morbid obesity, relates to food choices, amount of physical activity you get and the effort to maintain your health. The increase in caloric intake has also decreased the nutrients consumed that are needed for a healthy diet. This behavioral problem also relates to the increase in portion sizes at home and when dining out. The influence of television, computers and other technologies discourage physical activity and add to the problem of obesity in our society. Science shows that genetics play a role in obesity and morbid obesity. 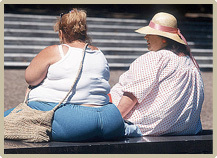 Genes can cause certain disorders which result in obesity. However, not all individuals who are predisposed to obesity become morbidly obese. Research is currently underway to determine which genes contribute most to morbid obesity. What are the social effects of morbid obesity? Individuals affected by morbid obesity often face obstacles far beyond health risks. Emotional suffering may be one of the most painful parts of morbid obesity. Society often emphasizes the importance of physical appearance. As a result, people who are morbidly obese often face prejudice or discrimination. Due to the negative stigma associated with morbid obesity, morbidly obese employees are often viewed as less competent, lazy and lacking in self-discipline by their co-workers and employers. Often times, discriminatory attitudes can negatively impact wages, promotions and employment status for obese employees. Negative attitudes about morbidly obese patients also exist in the healthcare setting. Morbidly obese patients that are often reluctant to seek medical care may be more likely to delay important preventative healthcare services and may more frequently cancel medical appointments. Delaying medical attention can lead to delayed discovery or treatment of co-morbid conditions, such as diabetes and cardiovascular disease, while becoming more physically damaging. The consequences of discrimination against the morbidly obese can seriously impact an individual’s quality of life and only further intensify the negative stigma associated with obesity. In addition to weight-loss surgery and medically managed weight-loss, the following therapies are also utilized to treat morbid obesity. Behavior plays a significant role in morbid obesity. Modifying behaviors that have contributed to developing obesity is one way to treat the disease either alone or in conjunction with other treatments. A few suggested behavior modifiers include: changing eating habits, increasing physical activity, becoming educated about the body and how to nourish it appropriately, engaging in a support group or extracurricular activity and setting realistic weight management goals. Increasing or initiating a physical activity program is an important aspect in managing morbid obesity. Routine physical activity can greatly impact your health. Set realistic goals and make sure to consult with your physician before initiating any exercise program. What can you do to learn more about morbid obesity?